A pupusa is a thick, hand-made corn biscuit-like flat bread (made using masa de maíz, a maize flour dough used in Latin American cuisine). Left: Two pupusas on a plate served with a side of coleslaw-like salad. It is stuffed with one or more of the following: cheese (queso) (usually a soft cheese called Quesillo found in all Central America), fried pork meat ground to a paste consistency (called chicharrón, not to be confused with fried pork rind which is also known as chicharrón in some other countries), squash, refried beans (frijoles refritos), or queso con loroco (loroco is a vine flower bud from Central America). There is also the pupusa revuelta with mixed ingredients, such as queso (cheese), frijoles (beans), and chicharrón or bacon. 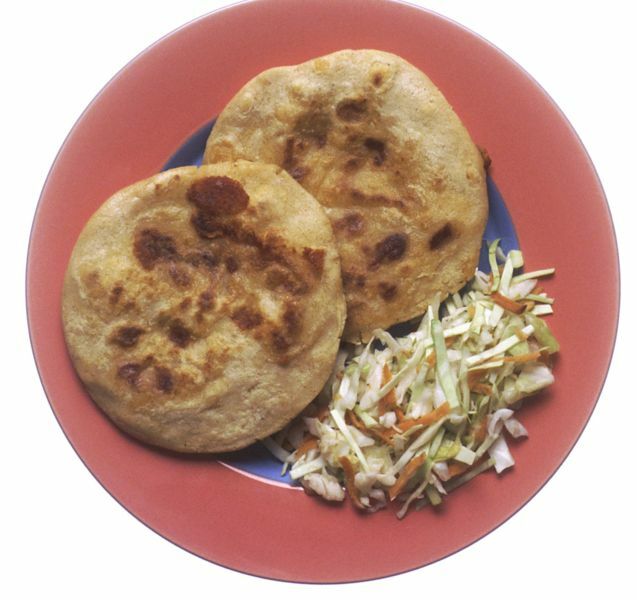 Pupusas are similar to tortillas and especially to arepas. In fact, in El Salvador, normal tortillas are about the same diameter and thickness as pupusas, without the filling. Pupusas are traditionally served with curtido (a pickled cabbage relish, similar to German sauerkraut and Korean kimchi that comes in mild and spicy varieties) and tomato sauce, which are traditionally eaten by hand.